This story about the dismissal of an elementary school principal suggests that groups like Parent Revolution that support parent trigger laws may have seriously overreached in their efforts to vilify and demoralize teachers and administrators at traditional public schools. 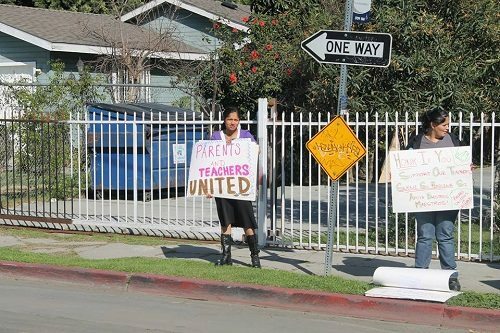 At Weigand Avenue Elementary School in Watts, with 53 percent of the parents calling for a change in the administration, the principal, Irma Cobian, was forced out. Several parents turned out to express their support and appreciation for Cobian, including one who regrets having signed the trigger ouster. Of the school’s 22 teachers, 21 have asked for transfers out of the school in a display of loyalty to Cobian. They noted that anti-Cobian graffiti has been scrawled on school walls and on Cobian’s car. Something doesn’t add up. Cobian hardly seems like the ogre or incompetent that Austin describes. But Cobian is the first administrator ousted from the Los Angeles public schools under the trigger law. It feels like Parent Revolution was flexing its muscle and putting teachers and administrators on notice. The result seems certain to demoralize teachers far beyond the Weigand Avenue Elementary campus. A button on the webpage of Parent Revolution is, “we <3 our teachers.” The Weigand Avenue Elementary School teachers clearly don’t feel “<3’ed”. Advocates for supports for people with chronic mental illness are in a Catch-22: They find themselves supporting situations that are at times not ideal out of fear that the alternatives may be worse.